If you have something to suggest, something you’d like to submit or a question you want answered, please leave a comment or send me an e-mail. What do I do with my baby after he or she is born? If you give birth at home and retrieved the body, try to keep the baby in a saline solution or water until the burial. You will need to keep the container in the refrigerator, although this is not recommended for more than several days. (I don’t know what the maximum time is, but just be aware.) The reason for this is that the baby has been in his own waters since conception and looks “natural” there. When Innocent was in water I could see his infinitesimal toes. Out of the water I couldn’t. Because his skeleton is not very hard, his body, especially his head, will “flatten out” over time unless he is supported by fluid. This is not practical with babies over a certain size, but by then this is not so much a problem. Do be aware that even 20 week babies’ heads are very malleable and expect to see this phenomenon. If you can’t keep the baby in fluid, you still need to keep him in either the refrigerator, or, if you anticipate burial will be delayed for a while, in the freezer. I recommend not keeping the baby in fluid if you will be using the freezer. I want to take pictures of my baby, but what if he is disfigured? Take pictures that include the entire body even if there are disfigurations. Later you may want to be able to see the entire baby just to remind yourself of what he looked like. Memories fade and change over time and this way you will be able to see him as he was. Take pictures that focus on details like hands, feet, ears, legs crossed, whatever. Wrap the baby in a bit of cloth and take pictures of that. Take pictures of the hands on top of the blanket. Place your wedding ring around his ankle. No one will be judging these photographs later so take whatever photos you like. Take pictures under different lighting: daylight, lamplight, dim, bright, whatever. I suggest not using the flash especially if you are photographing a very young baby. Their skin is very smooth and will be wet and reflects the light in a very distracting way. Instead of using a flash, adjust the ambient lighting. Beautiful photographs can be taken of any baby. Even if your baby is very tiny and has deformities (see Bethany’s baby Blessing on the photographs page under 8 weeks) you can photograph them. If this is something you feel that you really aren’t up to, ask someone else to do it for you. If you are delivering a baby over 25 weeks, a Now I Lay Me Down To Sleep photographer will come to the hospital to photograph the baby free of charge. Advice: Take more photographs than you think you ‘need’. These are the only photographs you will have. I treasure even the very blurred photographs of Innocent because I don’t have many of him. My only regret is that I didn’t take more. How do I bury my baby? You can purchase a casket, although you will most likely have to do this on-line as funeral homes do not usually have anything smaller than a newborn-sized casket which would overwhelm an 8 week baby. A site I found is Heaven’s Gain, a home-based business that offers caskets in sizes divided by trimesters. They also offer clear bottles to fill with water and use along with the caskets for younger gestation babies (see reason above). You can use any special container that you would like, although you should try to make it respectful. Craft stores and hobby shops usually sell small unfinished wooden boxes that work well for caskets. Embellishing them can be a very simple process involving folding a piece of cloth into the bottom. Putting an icon in with the baby or affixing it to the inside of the lid is nice as is putting a cross somewhere on the outside. Where do I bury my baby? It is recommended that you not bury the baby on your property. If you should move, this may be a problem. Many church cemeteries have special areas set aside for babies. If not, you can inquire about a small space there. Public cemeteries, if they do not have a special area set aside, have allowed parents to bury a baby at the foot of another family grave or another such compromise. Some cities have cemeteries just for babies. Ask questions. You should not have to purchase an entire plot. Our own baby is buried in a family cemetery in the country. Friends or church members may be able to make this available for you. Check with the local department of health about local regulations regarding burial on private property. I suggest you think of your baby’s grave as just that: his grave. If you think of it as him, then you are setting yourself up for unnecessary heartache. We believe that the baby’s soul is in Heaven. It is important to care for his mortal remains with respect, but the mortal remains do not represent him. By all means, put a cross on the grave. Plant flowers. Bring flowers. Trim the grass. But I suggest not propping up teddy bears, pinwheels or other toys at the grave. It gives the impression (even if you tell yourself otherwise) that this is his substitute nursery. If you ever have to relocate and move to a distant location, you will begin to feel guilty that you are not “visiting” him. Different people will handle this in different ways, but this is something to consider. This is such a tough situation. Sometimes women miscarry very early and it is not possible to distinguish the amniotic sac from everything else. Women may have a D&C or laparoscopy for an ectopic pregnancy and not be able to retrieve the body from the hospital. Sometimes a woman flushes the body, for whatever reason, but later regrets it. The end result though is no body to bury. The Church does not tell us what to do in such a situation, but people generally put up a memorial stone or cross. There are many cemeteries which have areas just for miscarried babies who were unable to be buried. I’ve visited a monastery that had a special section like this. It was very beautiful. You can still say prayers for the departed. One thing you do have to do is move beyond any guilt surrounding such a situation. It is nice to be able to bury our babies, but if we are not able to, it doesn’t change the fact that they are immortal souls who are loved very much. All bodies decay. Some saints bodies were unable to be recovered. It’s ok. This is a tough one. I’ve only been asked this twice myself since Innocent died (although I know that number will increase) and I answered differently each time. Once I said that I had five living children and my youngest had died before birth. The other time I said, yes, I have five children. Most of the time you would think this would be such an easy question. How many? One. Or Four. Or whatever. But when you can’t actually see the child(ren) in question…what do you say? If this is your long-lost cousin Sam, then you might feel comfortable saying, “I have two angels waiting for me in Heaven”. But if it’s someone at the grocery store who stopped to admire your son’s big, blue eyes and then says, “Is he your only child?”, then what do you do? Say, “Yes,” because you don’t feel like going into the whole thing with someone who will be moving on to squeeze cantaloupe in thirty seconds, but feel like you denied the existence of your other child? Say, “No, but his older sister was born too soon at fifteen weeks so she’s in Heaven now,” and risk getting into a discussion you really didn’t want to get into? Is it worth it? The answer is one only you can answer. As I mentioned above, I’ve answered differently depending on the situation. With people I’ll probably never see again, I will probably generally just admit to five. With someone I will be seeing now on a regular basis, I’ll probably tell the whole truth. But you never know; the day you just decide to bite the bullet and number your departed children with your living children may be the day that the person you’re talking to really needs a listening ear for the same situation and would never have brought it up. I think you just go with what is most comfortable at the time. As time goes on, you may feel more comfortable with one answer or another. I think the people who have the hardest time with this are the ones who have no living children. You and your spouse are at a couples dinner at church and after you mention to someone that you’ve been married six years they say, “Do you have any children?” Some of the same stuff mentioned above applies here, but it will probably sting much more. Kind of the way you would feel on Mother’s Day if you have children in Heaven but none on earth. Are you a mother? I will go ahead and say unequivocally, “YES, you are a mother.” What you decide to answer to a perfect stranger, however, is entirely up to you. Just don’t feel bad for whatever you decide to say. Studies have shown that children do better when death isn’t hidden from them. If you have an intact body, you can offer your other children the chance to see the baby. If possible, make the context as ‘un-gory’ as possible. My children saw Innocent after he was “laid out” on a tiny fleece before I placed him in his casket. They all decided voluntarily to see him and two of them held him (wrapped in fleece). I didn’t force anything. They all participated in the burial and the 40th day prayers. Some drew pictures for him and picked flowers for him. They are comfortable with the knowledge that his is a part of our family, albeit gone from us. His icon is in the icon corner with all of the other family patrons. I did shield them from the actual delivery – thank God it took place in the middle of the night. I did not offer details about that although I would have given a child’s version if asked. Children accept things much easier than many adults. Obviously you need to tailor things to a child’s age. If you have specific questions or worries I suggest talking to your spiritual father or parish priest. This can be the most difficult topic of all, because everyone has an opinion, and your doctor and your friend’s doctor, and internet sources, and your mother, and your partner will all say different things. You will personally go from wanting to try again RIGHT NOW to never wanting to try again, sometimes in the span of five minutes. You may not agree with your doctor. Your partner may not agree with you. You are already grieving, and upset, and feeling like a failure, and thinking too long about this topic can make you feel so very much worse. Accept that there are many opinions. Let me tell you a bit about why. Doctors are trained to recognize that a woman needs emotional healing, but not really to help them or explain it to them, since it goes beyond their “bones and tissues” type of practice. Three months is considered the average amount of time a women will grieve hard over a loss, and will have a difficult time (and be a difficult patient) if she gets pregnant prior to that. While there are a few doctors who believe that your uterine lining must take three cycles to get back to rebuilding itself fully each time (especially after a D&C, where it gets scraped pretty thin), most doctors know that it doesn’t really matter in about 80% of the cases, and getting pregnant again right away does not carry any increased physical risk or miscarriage risk. So even among doctors, some will say the standard “wait three cycles” and might even scare you into thinking you’ll have another miscarriage if you don’t wait, and others will say go ahead and try again now. Read the rest HERE. Incidentally, this is a very good website for miscarriage information. Before you jump into the fray with this one, permit yourself to examine whether you are in part trying to get pregnant quickly to bury the pain of your miscarriage. It can be hard to look at this honestly. Even if you really are not trying to replace the baby you lost, you can still admit that it would be a relief to experience the happiness of being pregnant again. It’s ok. Don’t mistake the natural happiness of pregnancy with simply replacing one baby with another. After a miscarriage women are naturally prone to guilt trips and this is another opportunity for false guilt. Don’t fall into it. More likely you are comfortable with the idea of another child and feel that you are mourning your baby appropriately, but you are worried about what other people will think. The fact is that there will always be someone who will be unhappy you are pregnant, like it or not. You can’t make decisions based on what other people will think. Pray and talk to your spiritual father. He can help you sort through the complex feelings and issues. If you suddenly find to your surprise that you are pregnant right after your miscarriage, then give yourself a bit of a break. It hasn’t been long and grief, happiness, worry, fear, shame, etc. will be all mixed together. Allow that God has permitted this to happen and trust in Him. Again, pray and talk to your spiritual father. Studies have shown that the risk of miscarriage does not increase if you conceive right after a miscarriage. Do take good care of yourself, getting rest, eating well and taking prenatal vitamins. See your doctor or midwife. If people make snide remarks, even in the guise of “only being concerned for you”, ignore them. You’re already pregnant; what do they want you to do? Thank them for their concern and drop it. [Also see section on “What if it happens again?” on the “Picking up the pieces…” page. I want to make a memory box for my baby but the loss was so early I don’t feel like I have anything to put in it. 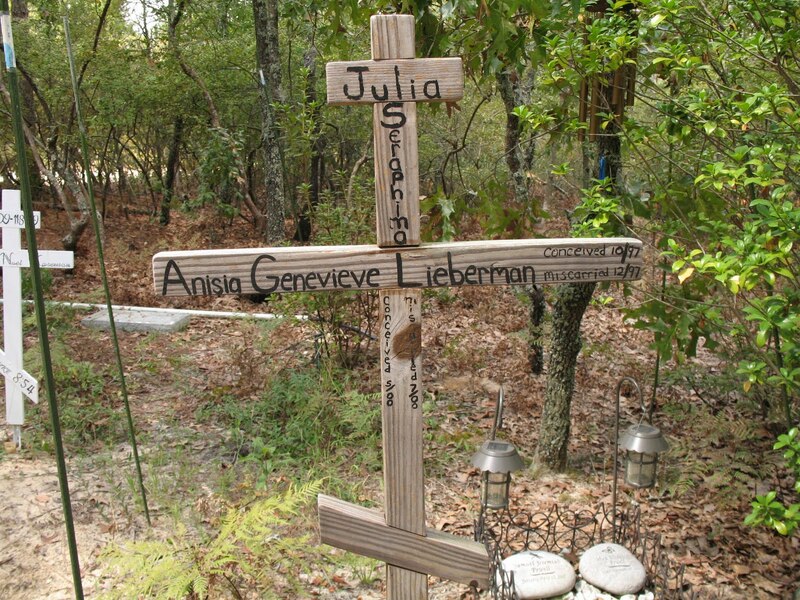 photos of the burial site or memorial stone/tree/cross, etc. When I buried my pets, and I know this isn't the same to a lot of people, but to me they were my babies, my souls, my reasons for living, they were a part of me just as much as my own child is, I buried them in containers with a plant on top. The plant would then be named as the pet was and I could still talk to him/her and it would always be with me. I carry my containers back and forth, where ever I move to, so they are never lost. I don't know how legal this is, but for some who's babies are small, maybe this is an option? Please, I don't mean ANY disrespect. It is something I thought about for people who'd want to carry their babies with them as I do with my pets. I also did it for my grandma but she's not literally in a container. I simply planted a rose that had her name and this is how I talk to her. You could also do that too just in case it's not legal to put human remains in a potted plant although no one would know unless you tell them, right? You could just say I named this plant after my baby to keep him/her close. Im doing this for my daughter cause she is a mess right now. Is saline better than water to place baby in? All i have is Saline nose spray, can i use that? What kind of camera or app shld i use for pix ? I have a smart phone only. I opened the sac of a 7 week old baby, i see a mass, a black dot and a line of black dots, what am I seeing? Why am I not seeing a baby form? My granddaughter passed a week before she delivered her. If she gives the remains to dr for testing, will there be a problem getting her back? Also, i have a pix of the opened sac. Hoe can i upload? Anonymous, I'm so sorry I did not get back to you sooner. I did not get a notification about your comment so I did not see it until just now. Regarding saline, it's just very, very weak salt water. Because it's not sterile you would want to keep it in the fridge (temporarily) or bacteria will grow. You can make saline or you can just use plain water in the short term. You can send me a photo at lostinnocentsorthodox (at) gmail.com. I can't promise I will definitely be able to identify everything in the photo but I will do my best. I know the answer to this question is coming too late, but regarding testing the baby, depending on the lab they may not be able to do any tests because everything is so tiny. If they were able to run any tests you would not be able to receive back any remains because they would have to use everything you gave them. It's good to be aware of this. I'm so sorry for your and your daughter's loss.